The United States Patent and Trademark Office (USPTO) has issued US Patent No. 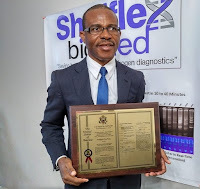 10,072,309 to Dr. Dougbeh Chris Nyan for his invention of a rapid, real-time isothermal multiplex pathogen diagnostic test that detects and identifies many infections in less than an hour. Nyan is a Liberian medical doctor and scientist with expertise in infectious diseases and developing simple diagnostic tests for hard-to-reach settings and the global healthcare community. This proprietary technology is applicable to developing pathogen diagnostic test kits for simultaneous detection and differentiation of multiple infectious such as HIV/AIDS, Hepatitis B, C, and E, West Nile virus, Ebola, Malaria, Dengue, Lassa and Yellow fever viruses, West Nile virus, Zika, and a variety of other infectious. The technology was published in Nature-Scientific Reports and the International Journal of Infectious Diseases. Accordingly, the Nyan-Test is capable of detecting at least 3-7 pathogens in less than an hour, thus enabling healthcare workers to identify infections and carry out specific treatment. The test is affordable, portable, cuts down detection time, and applicable to settings in the developing countries and vulnerable communities of the developed world. It can be used in early diagnosis, monitoring of the safety of blood products, and surveillance to prevent epidemics. His career in medicine and research spans over twenty-five years. He studied Zoology and Chemistry at the University of Liberia from where he was expelled by the military government of Samuel Doe in 1988 for his advocacy for democracy, press freedom, and human rights. He was arrested and imprisoned by the military government for his pro-democratic advocacy and later exiled and lived in Germany where he studied human medicine at the Charité Medical Faculty of the Humboldt University of Berlin. He worked as scientist in infectious diseases at the US National Institutes of Health, the University of Pennsylvania School of Medicine, Naval Medical Research Center, the US Food and Drug Administration and in the biotechnology industry. Dr. Nyan testified before the US Congress on September 17, 2014, during the Ebola outbreak in West Africa. He advocated for a sustained and coordinated support to the Ebola-affected countries of Liberia, Sierra Leone, Guinea, and Nigeria. He requested the U.S. Government to send health experts and technical personnel to the affected region. He also advocated for the establishment of an African Center for Diseases Control and Prevention, now in Addis Ababa, Ethiopia. In recognition of his invention, Dr. Nyan has received numerous awards and recognition including the prestigious 2017 African Innovation Award Special Prize for Social Impact, the Lifetime Achievement Award in Science and Medical Research form the Ward Fund, and the Science and Research Award from the Liberian Award. Nyan’s multiplex test was also recognized as one of Top 3 Innovations by the Africa 2017 Business Forum in Egypt and recently exhibited as one of Top 50 Innovations at the Africa Innovation Summit 2018 in Kigali, Rwanda. Nyan’s patented technology comes amid the rise of infectious diseases in vulnerable settings in Africa, Asia, and South America and disease re-emergence in neglected communities of the United States and other developed countries. The Nyan-Test projects to be life-saving and contribute to quality healthcare globally, while providing a multi-billion dollar investment opportunity to the global business community. 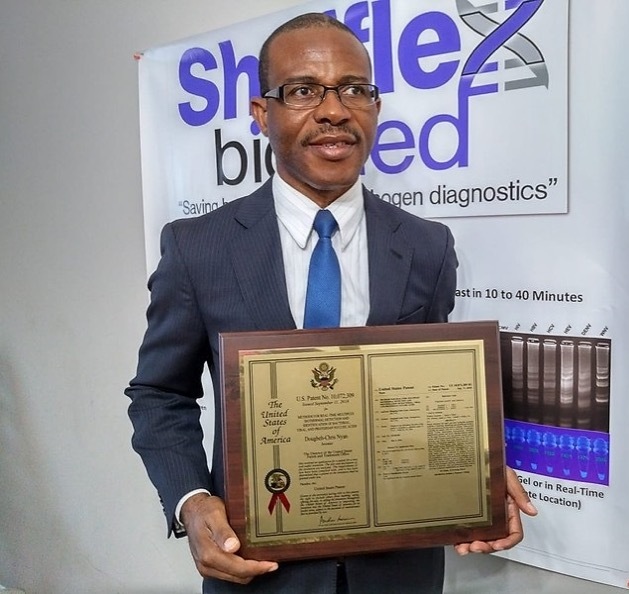 Dr. Nyan’s biotech startup, Shufflex Biomed, is now raising funds to produce version 2.0 of the test and carry out field studies in Africa and South America. Title: Methods for real-time multiplex isothermal detection and identification of bacterial, viral, and protozoan nucleic acids. Abstract: Herein disclosed are rapid real-time isothermal multiplex methods of detecting, identifying and quantifying bacterial, viral, and protozoan nucleic acids in a sample. These include contacting the sample with two or more sets of pathogen-specific reverse transcription loop-mediated isothermal amplification primers and novel oligofluorophores specific for the target bacterial, viral, and parasitic nucleic acids of interest such as human immunodeficiency virus, Ebola virus, Marburg virus, Yellow fever virus, hepatitis-B virus, Lassa fever virus, Plasmodium, hepatitis-C virus, hepatitis-E virus, dengue virus, Chikungunya virus, Japanese Encephalitis virus, Middle Eastern Respiratory Syndrome Corona virus, Mycobacterium, West Nile virus, Cytomegalovirus, Parvovirus, Leishmania, Trypanosoma, and Zika virus nucleic acids, under conditions sufficient to produce detectable real-time amplification signals in about 10 to 40 minutes. The amplification signals are produced by pathogen-specific fluorogenic labels included in one or more of the primers. Also, novel reaction and sample lysis buffers, primers, and kits for rapid multiplex detection, quantification, and identification of bacterial, viral, and protozoan nucleic acids by real-time isothermal amplification are herein disclosed.